These are both events I attend as well as ones that I host (such as my baby shower). Hopefully they are of interest to you! Cafe Sydney: Behind The Scenes Tour! I was lucky enough to accompany my friend Lorraine, who writes the blog Not Quite Nigella, on a very special ‘Behind the Scenes’ evening at Cafe Sydney, Circular Quay a few weeks ago. We got to be part of a staff meal, listen to a front of house briefing, get a tour of the kitchen, watch the kitchen in action during busy service and then dine in the restaurant as customers! Australian Ham Week started yesterday. Celebrations kicked off last night with the announcement of the Australian PorkMark Ham Awards for Excellence winners. The awards were held at Aperitif with special porky canapes being whipped up by owner and head chef Derek Baker. I couldn’t attend as I had a hospital appointment and I’m also not eating cold meats at the moment (pregnancy!). However, I’m excited to hopefully be reviewing the Aperitif restaurant soon, so stay tuned for that. Australians spend $572 million on ham products but only $170 million of that amount is spent on Aussie pork products. Yikes! Did you know that if you buy a whole bone-in ham leg then it is guaranteed to be Australian? I only found this out recently so will endeavour to do so from now on. It’s funny that the lovely Stewart invited me to this event because hubby and I were just talking about how fun it would be to celebrate Christmas in July one year. 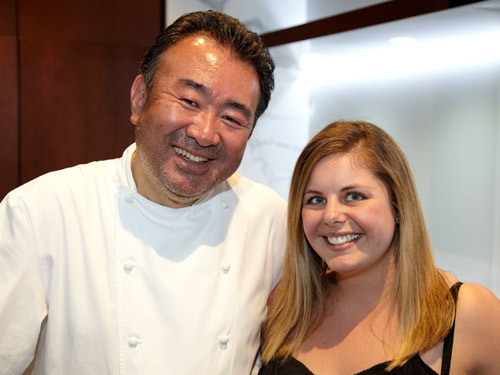 Win a Masterclass with Tetsuya Wakuda at his Sydney restaurant, Tetsuya’s! That’s me and ‘Tets’ – or Tetsuya Wakuda for those who haven’t met him! He’s a world-famous chef and owner of the equally world-famous restaurant Tetsuya’s in Sydney. Last week I had the privilege of being invited to attend one of his extremely coveted Masterclasses (he only does 12 a year!). I have to immediately give a big warm thank you to Electrolux, Open Haus PR (especially Nicole) and of course, Tetsuya for inviting me. It was truly a once-in-a-lifetime, dream experience. Guess what? You can win a chance to do it too! Don’t rub your eyes, you read that right. Fig & Cherry and Electrolux are giving you the chance to attend an exclusive Masterclass with Tetsuya. Competition details are at the end of this post… Don’t want to wait? ENTER NOW! Looking for an exclusive ‘pop up’ event? Look no further! A friend of mine (well, actually, my brother-in-law’s fiance’s brother’s girlfriend – can you see why I just said ‘friend’? :)) is travelling across the globe from Paris to Sydney for a very exciting food event. As I entered the gates my mind was focused on my first mission – find a dagwood!